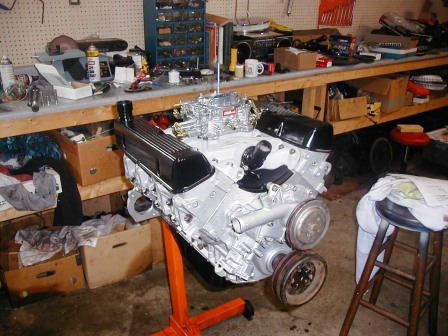 Rover PB 3500 Block, crank and pistons (10.5 - 1), Crower 276 degree - 488 lift Cam, Heavy duty double roller chain and gears, Heavy duty lifters, ARP main bearing studs and ARP rod bearing bolts. Rover SD1 Heads with three angle valve job and new valves (bigger ports then the stock heads), MGB block hugger headers, Offenhause 4 barrel manifold and Edelbrock 500 CFM carb. Mallory magnetic distributor, Mallory 8 mm wires, Bosch Platinum plugs, TS Automotive custom flywheel, Weber clutch, hydraulic throw out bearing, D&D GM bell housing, Camaro T5 5-speed, Hurst Shifter, D&D custom driveshaft, Rover SD1 valve covers, Buick 215 water pump, GM alternator, custom motor mounts. 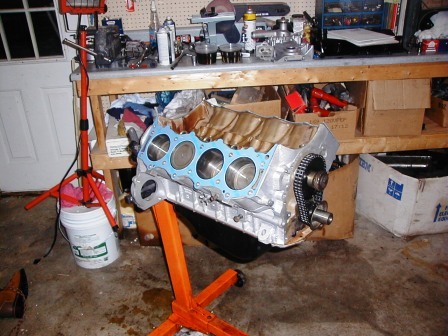 I am estimating output at 215-225 based on what I have researched on this engine. Okay, so now I had an engine for the car. Now I have make it fit in the available space! I first pulled the old engine and transmission (not that old, they have less than 10,000 miles on them) and cleaned up the engine bay. These old engines do throw a lot of oil even in just 10k miles. With the engine bay cleaned up, first order was to lower the engine in the bay and see what needed to be done. I did this exercise probably 20 times as I checked, and rechecked possible engine/transmission locations. Front, back, height, all had to be checked and rechecked to ensure the engine would clear the hood and that I could route the steering around engine. 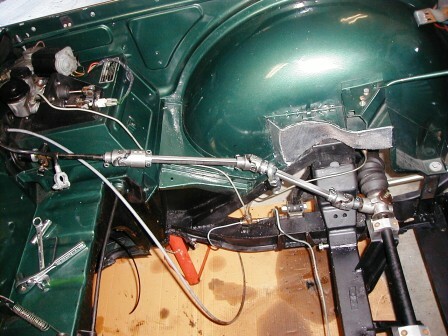 The final result was based on using motor mounts bolted to the stock cross member on the frame and rising up to the stock Rover rubber mounts. 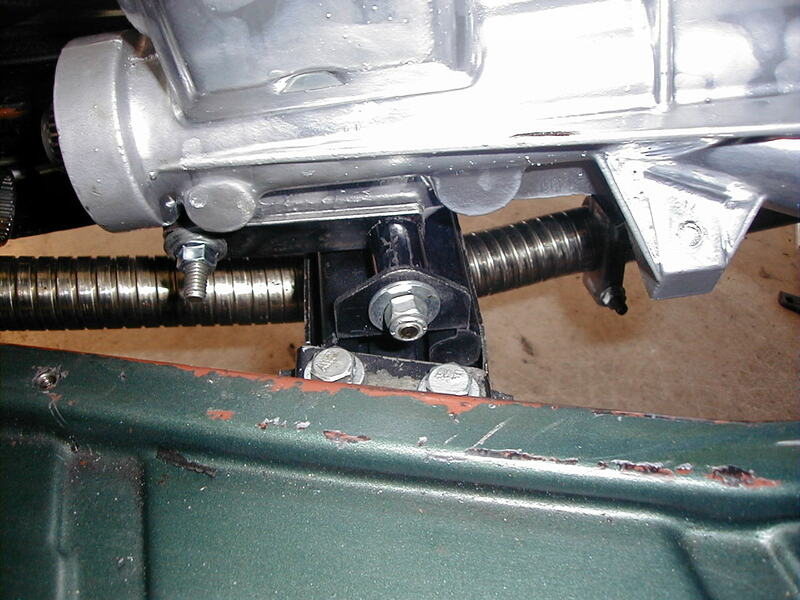 Based on this position, the headers could be fit around the A-arm mounts on the frame (barely) and the only sheet metal to be trimmed was the small "points" on the upper wheel well around the front A-arm and spring tower. This could be done and since this is missing on both older TR4's and the 250's, probably no one would notice unless it is pointed out. So out came the sawsall and this was quickly trimmed. 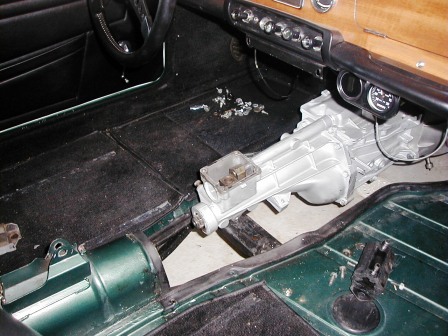 With the "points" out of the way, the engine could be brought forward a few inches and the transmission shifter was roughly in the stock position. Next step was to weld up some motor mounts and bolt it together. 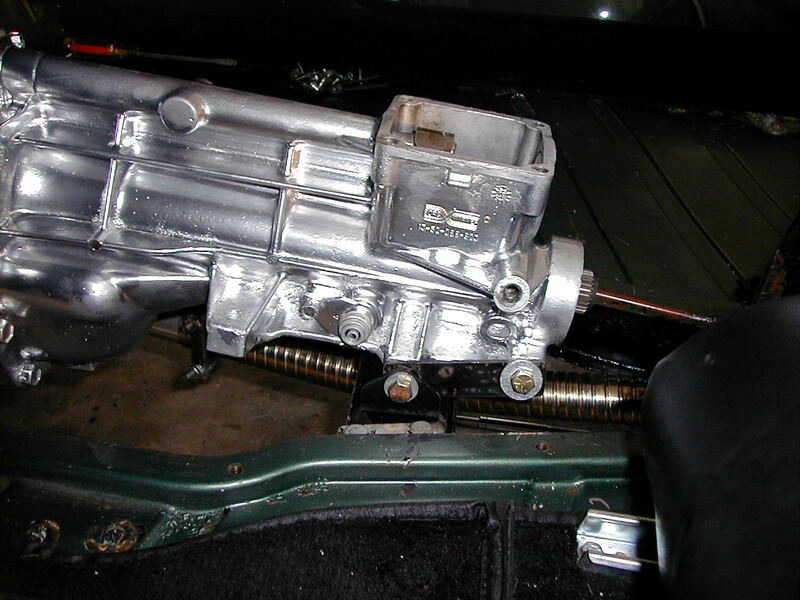 The transmission mount is a combination of the stock TR4A rear mount and the Camaro brackets on the tail of the transmission. D&D built me a custom drive shaft to my specifications and all bolted together as it should. 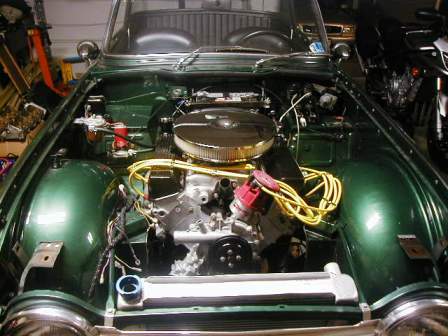 The exhaust is made up of down pipes that mate to the stock TR4A rear dual mufflers for a true dual exhaust. 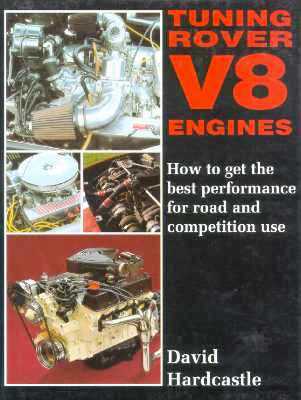 Result is quieter than expected, but nothing can hide that V8 rumble! Next step is to pull the engine back out and build the new steering system. The only safe way to do this is use Borgeson steering components. 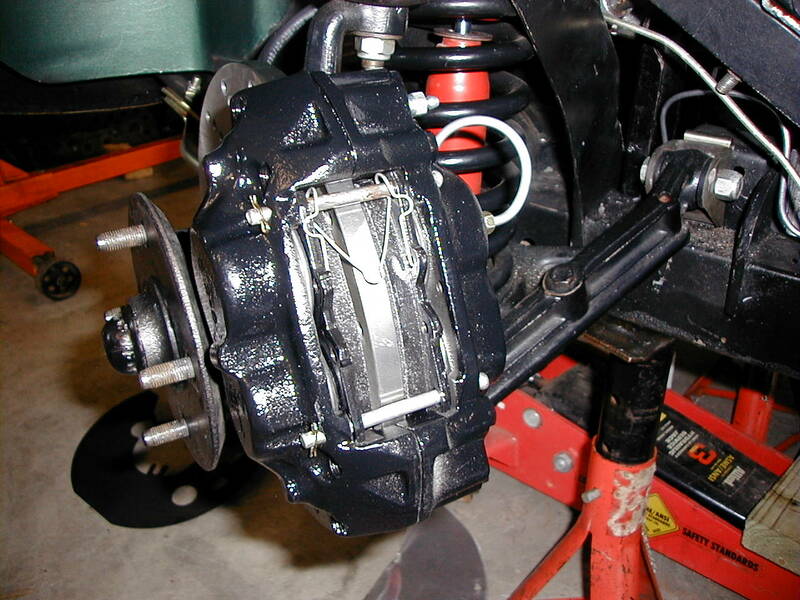 This company specializes in the parts to build a heavy duty steering system that allows you to take the Triumph splined rack fitting and adapt it to a 3/4 D shaft, using a combination of flex joints, vibration dampeners and mountings, a steering system can be routed around the V8 block and headers. The result is a stronger solution with more feel than the stock rubber donut system. Here is the routing for the steering. With final engine placement, there were a few adjustments that were necessary to clear everything, but this is the basic layout of the steering system. With the steering settled, it was now time to get everything back in the car. 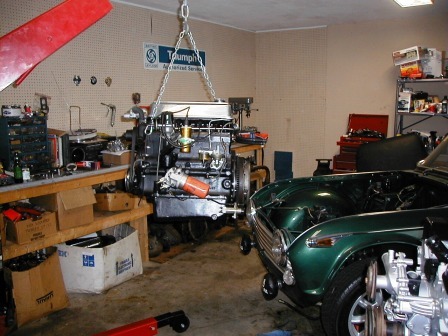 The engine and transmission installed back with little hassle. All the components had been installed and removed enough time so I could do it in record time (and with the clutch problems I had, I would get more practice). 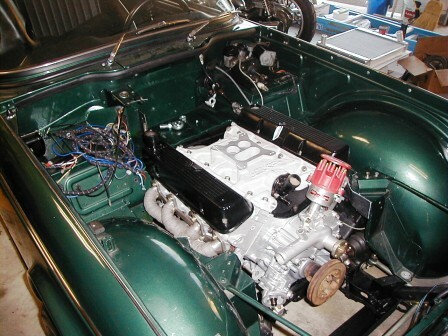 With everything bolted up, it was time to route the fuel lines, exhaust, wiring and cooling system. I bought an aluminum "generic" radiator and had to make my own mounts to hold this in place. Since this is for a GM 350, I should have plenty of cooling, with the electric radiator fan and a thermostat. I'll build a radiator shroud when this is completed. I hooked up the radiator and then mounted the GM alternator. The instructions on the VTR site for installing a alternator in a Triumph were very helpful and I modified my voltage regulator box to hide the conversion. The difference in the headlights and interior lights is amazing. The TR generator is such a bad joke! I used to have to rev the engine at a stop light to be able to see. Once everything was back together, I topped up all the fluids and hooked up the battery. With some fear and excitement, I cranked it over. Nothing! 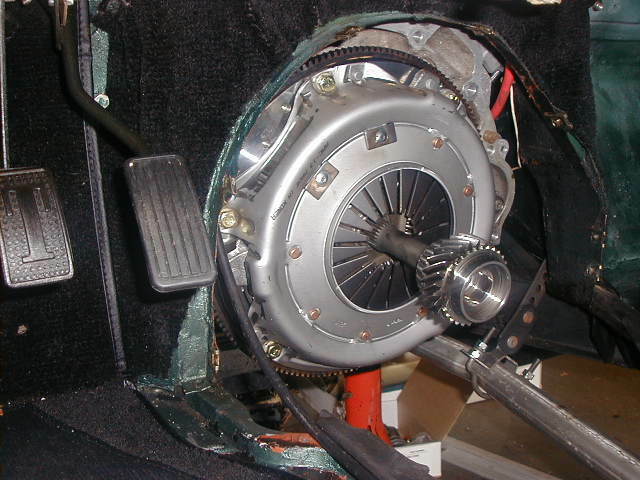 After several days of trying everything (fuel, spark, etc...) I decided that I must have the cam in backwards (180 degrees out of phase), sure enough upon a front engine tear down, it was backwards. This is the second time I built an engine and thought that TDC was correct only to find it was the compression stroke. In a few hours, I had the engine running on the jack stands. Okay, so after shifting the car on the stands a few times and running the engine for 1/2 hour at various speeds to check for leaks, etc... I was ready to go around the block. I lowered the car to the ground, backed it out of the garage and started it up. When I tried to put it in gear, it ground like the clutch was not working. Okay, so back in the garage to check the clutch. Everything appeared in order, but what works (at no load) on the stands does not work on the ground. So I ended up pulling the transmission. Double checked and triple checked the hydraulic throw out bearing clearance, replaced the clutch master cylinder with a Wildwood unit, bleed the system multiple times, but still no clutch. At TRF in August, I bought a special flywheel from Ted that will allow me to switch to a different clutch to see what the problem is. It appears that the pressure plate may not be releasing correctly with the Buick flywheel. The new flywheel lets me try a GM, Ford or Rover clutch so I'll get this resolved this winter so we have the car on the road this spring. Watch this space for an update of how it drives! Based on how it sounds, I think a brake upgrade will be the next step. Spring 2004 - Okay so it was time to get this project moving again. Armed with the new flywheel, I started attacking the clutch problem. I decided that I would replace the clutch, disk, use the new flywheel and also rebuild the T5 to make sure that everything was correct. I bought most of the parts on Ebay and/or Napa/AutoZone. The T5 was stripped down and found to be in good condition. I replaced some of the synchronizers and adjusted the shims for the input shaft bearing but other than that, it was basically a strip and re-assemble. This also allowed me to seal the case with permatex which stopped the leak it had since it was first installed (must be because it was installed in a Triumph). Before I finished with the transmission, I took the opportunity to center the clutch with the input shaft to make sure it was perfectly centered as below. Now that the clutch was done, I finished the transmission and reassembled everything. Much to my dismay after spending 5 hours on a Saturday (after many weekends of preparation), the clutch still did not work. I pumped the clutch pedal several times and it ended up leaking brake fluid out a fitting on the Mcleod unit. After this, I had enough with the Mcleod hydraulic throw out bearing. I know that people say that these units are fine and work great, but I have had to pull the transmission on this car so many times, that it is not funny anymore. So my next plan was to switch to a conventional clutch fork and external slave. After a trip to the junk yard to look at the possibilities, I decided that a GM/Camaro clutch fork should work together with the matching throw out bearing and pivot bolt. After consulting with D&D, I discovered that my aftermarket bell housing would not work as it did not have enough clearance for the fork to exit the bell housing. So I had them send me everything I needed. I listed the hydraulic bell housing on Ebay as well as the Mcleod and had both reach the asking price in a few hours! Okay, so now I have a conventional clutch mechanism, but what to use for a slave cylinder? At first I considered using the stock TR4 unit, but after looking at how it would mount, decided to look for an alternative. I looked at the Napa store at various Toyota, Nissan and GM slaves, but none seem to suit. Finally, I found the Wilwood pull slave on the internet. 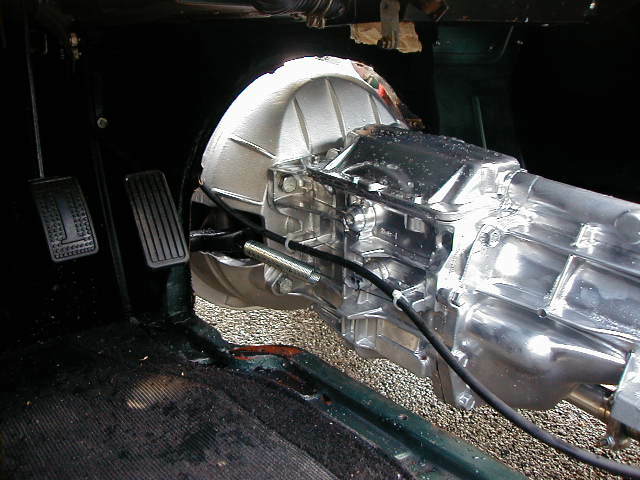 Now here was a slave that would mount under the engine (and clear the transmission tunnel). It also mounts in a unusual way being that it is a pulling unit, it mounts using a threaded rod. This allows me to connect it the engine mount and it pulls the clutch fork perfectly. It also allows me to use the current clutch hydraulic pipes. So all this was done the following Saturday and I started the car and gave it a test. Guess what, I now have a working clutch. 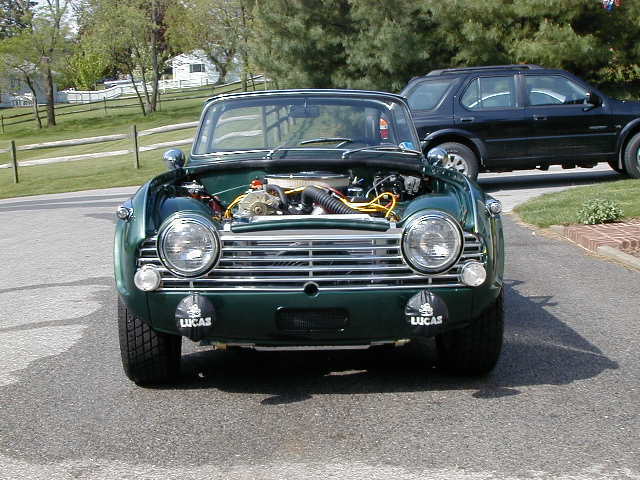 It will need some adjustments and I have to fix a leaking fuel pump before I go on any major rides, but the TR4A- V8 was able to travel up and down my road under it's own power!. Below are a few more pictures of the clutch fork. I'll do some other pictures from underneath so you can see the mounting for the slave cylinder soon. I have also included the rear mount as I strengthened it with some steel braces. 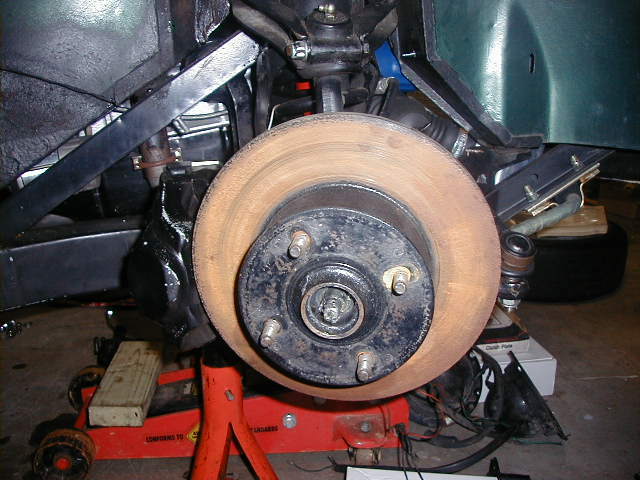 While I was looking at the car this spring, I took at look at what was possible as far as brake upgrades are concerned. 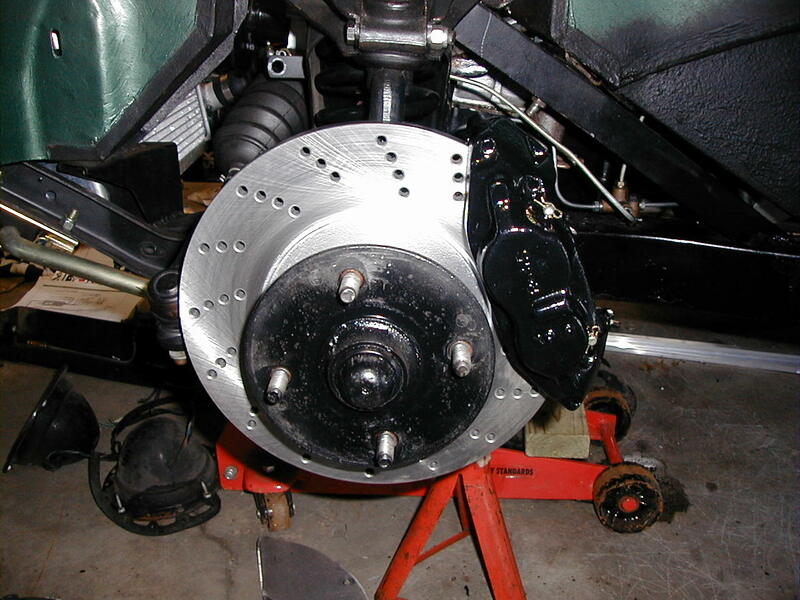 The goal was to upgrade the braking without making major changes. The VTR site has a tech article on using Toyota 4 piston calipers as a straight swap. Turns out you an get these at Autozone for as little as $35 each if you have the old cores. I bought an old set on Ebay for $25 and confirmed they fit. The high performance pads ended costing more than the calipers. 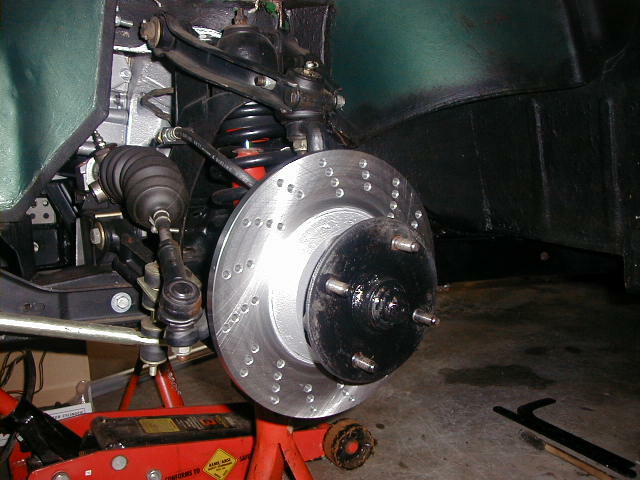 I also bought a set of cross drilled rotors (Brembos) to complete the high performance brake upgrade. Below are old and new photos, as well as a comparison of the calipers. This is a simple upgrade that should be quite effective.